This card game is a laugh-till-you-cry look at the Bard's smutty side. The judge presents a yellow card, your fellow kitchen-table thespians respond, and before you know it, you've got "If music be the food of ill-shaped fishes, play on." A laugh-till-you-cry look at the Bard's smutty side, the raunchy hilarity of this game knows no bounds. 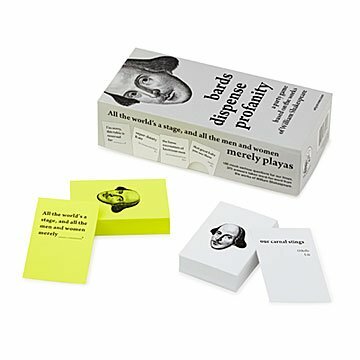 Invented by an English professor and his students, this adult card game asks the low-brow literary question, "To be profane, or not to be?" It includes 100 mock-serious questions for our time and 375 responses drawn word-for-word from the works of William Shakespeare. For four or more over-educated adult players only. Designed by Tim Cassedy, Chelsea Grogan, Jenna Peck, and Kate Petsche; made in Texas. We played a few rounds of the game ourselves, and zounds! Turns out it's pretty fun. Find out more on the blog. The administration of Southern Methodist University was very surprised when a successful business emerged from its English Department. Along with students Chelsea Grogan, Jenna Peck, and Kate Petsche, Professor Tim Cassedy invented literary-minded card games based on the works of Herman Melville and William Shakespeare. They co-own this unlikely company, giving a certain popular NSFW card game a run for its money. This was a prize on game night during a family holiday, which we promptly played. I played with my parents, who were a little wary, but they survived - and we all got a kick out of it. We did introduce a rule that cards we knew we'd never play (the Shakespeare quotes that were just a little too profane for the crowd) could be discarded. This was clever, well-executed, and perfect for my partner. Not everyone likes this type of game.I LOVE IT. We played Christmas morning just sitting around the tree. No preparation, no intense strategy, but lots of fun. It was a perfect icebreaker with millennial dinner guests. It was a hit...everyone was laughing at the crazy things in Shakespeare's plays. Not for the faint of heart. We only stopped playing because we ran out of time. Very nice quality. Love the sentence starters and the idea that all of the 'answers ' came from Shakespeare made it hilarious and great! Helps you remember your HS/college lit class about Shakespeare! My sister loves Shakespeare and loves games. So there you go.